A basic understanding of skin anatomy is important when explaining the process of skin biopsy. Each component of the skin plays a role in its daily function, therefore every component is a source of vital information that can be captured and assessed with a skin biopsy. Below are a few of the basic components of skin followed by a brief description their functions. 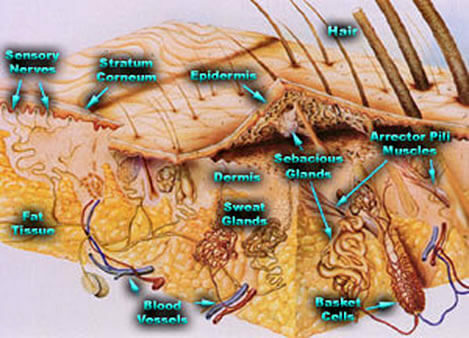 Epidermis - The epidermis is the next layer under the stratum corneum. Its function is to protect the body. It produces cells that will eventually become stratum corneum cells. It contains sensory nerves specifically small diameter sensitive temperature fibers. It is these sensory nerves that are helpful when evaluating a skin biopsy. Sensory Nerves - These are the nerves that innervate the epidermis. These nerves are the subject of evaluation when examining a skin biopsy after it has been immunostained. The sensory nerves in the epidermis serve to sense and transmit heat, pain, and other noxious sensations. When these nerves are not functioning properly they can produce sensations such as numbness, pins-and-needles, pain, tingling, or burning. When evaluated, characteristics of the nerve such as total number, contiguity, diameter, branching, swelling, and overall health are taken into consideration.